“Donald Trump you will go home and rethink your life.” Clem aged 11. Summer 2016 Re-Dock worked with young people aged 8 – 13 from Liverpool to run two summer schools at FACT Liverpool. Prototype introduces young people to digital making and testing as a creative tool to explore art. The 2016 summer school was led by Neil Winterburn, Hwa Young Jung, Stef Bradley and FACTLab’s Radamas Anja. Over three days young people tinkered with Raspberry Pi’s, Arduinos, DoodleBots and MBots, prototyping robots that made drawings, watered plants, greeted visitors to FACT, navigated mazes and sent messages to Donald Trump. As part of Cloudmaker, an ongoing FACT research program, artist in residence and founder of FACTLab Radames Anja supported the young people as they 3D printed models created in MineCraft. On the final day of Prototype we asked the young people to use robots to speak truth to power. Graffiti writer is used to empower people to make bold statements that otherwise might not be seen or heard. We wanted the young people to use the technical skills they had learned to make some statements of their own. The young people had already designed their own mazes, then programmed the robots to navigate the maze using a fixed path and then programmed the robot to navigate on it’s own using obstacle avoidance behaviours. They then used a system designed by FACTLab resident artist Radames Anja, to send text messages to a raspberry Pi mounted on the MBot robots, which then scrolled on an LCD display. The robots were taken out of the lab and tested on the streets of Liverpool, in Ropewalks Square. Youtube channel for videos of the groups Robot Messages. 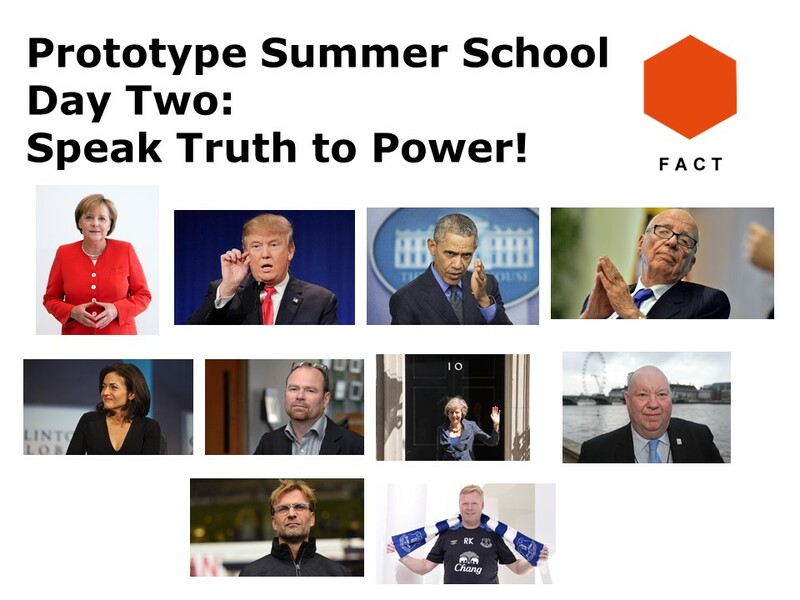 Prototype summer school was coordinated for FACT by Laura Haddick & Jakub Jezierski.